Hortus Camdenensis | Erigeron speciosus DC. Perennial to 45cm, robust, erect, perennial with leafy stems and flower heads, to 5cm across in corymbs, the ray-florets violet. To 60cm. There are a number of garden forms. [RHSD, Hortus]. ‘A native of California discovered by Mr. Douglas, and first cultivated and distributed by the Horticultural Society, is, I have no doubt, correctly referred by Professor Lindley to the same Genus. 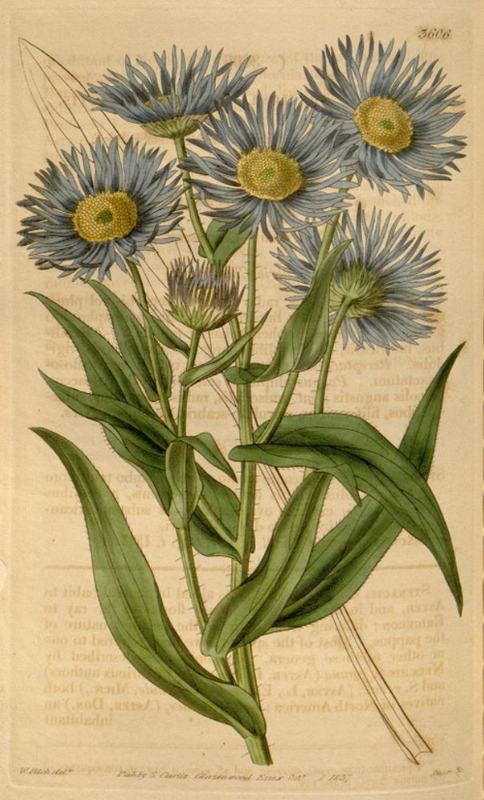 It flowers, like the Asters, in the latter end of summer and in the autumn, and is equally with the Aster entitled to the appellation of Michaelmus Daisy.’ [BM t.3606/1837 as Stenactis speciosa]. Introduced to Britain in 1833. [PD]. BR f.1577/1833. 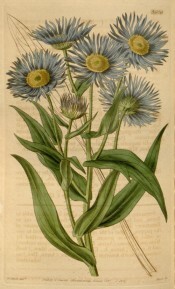 The only reference to this plant is a handwritten note in an 1850 catalogue in the Mitchell Library collection. [MP A2947A]. It was certainly grown in the gardens at this time.